The CSA profile for the Kyrgyz Republic was developed with funding from the Global Facility for Disaster Reduction and Recovery (GFDRR) (see https://www.gfdrr.org/en/who-we-are). CIAT, World Bank. 2018. 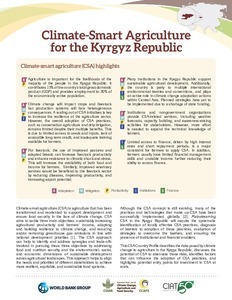 Climate-Smart Agriculture in the Kyrgyz Republic. CSA Country Profiles for Asia Series. International Center for Tropical Agriculture (CIAT); World Bank, Washington, D.C.